It's name is قیمه "Gheymeh!" خورش قیمه Khoresh-e Gheymeh! I will not call this dish a stew, or a casserole, or anything else for that matter. In my book it's one of the top five Khoresh and there are many delicious stews in the Persian cuisine. Hopefully, I'll get to share them with you all, one dish at a time! This is a simple but very tasty dish that, for me, not only satisfies my hunger, but warms my heart and soothes my occasional longing for home, even after all these years. However, as soon as I start cooking gheymeh, slicing an onion and pouring oil into a heated pan, the aroma of sauteed onion with turmeric, browning meat, stirring in those tiny yellow split peas and piercing the dried lemons, I feel at home once again. 1 cup yellow split peas, picked over and washed. 4-5 dried limes (limoo amani) may be purchased from an Iranian/Persian grocery stores. Soak them in water for 5 minutes and then pierce them in a few places with a dinner fork. Heat 1 tablespoon of oil in a small pot over medium heat, add the tomato paste and saute for 2-3 minutes, stirring frequently, until it starts to change color. Set aside. Heat 3 tablespoons of oil in a large pan over medium heat, add the onions and saute until they are translucent, add turmeric and stir well. After a minute or two, add the meat and brown on all sides. Add salt, pepper and a pinch of cinnamon. Stir well. Add the yellow split peas to the pot and saute for 5 minutes, spoon in the the tomato paste. Mix thoroughly. Add water to cover all the ingredients in the pot by 1-2 inches. Add in the dried limes. Lower the heat, cover and cook for about 1-1/4 hours or until the meat is well-cooked. Add a little bit of water and adjust the seasoning when needed. Yellow split peas shouldn't turn too soft and mushy, they still need to have a bit of bite to them. You may parboil them separately until they are just tender and add them to the pot in the last 30 minutes. In the last ten minutes add the rosewater if you like. Gheymeh is usually served with fried potatoes on top. 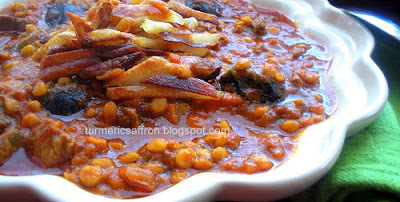 Serve gheymeh in a large bowl and top with a layer of fries. 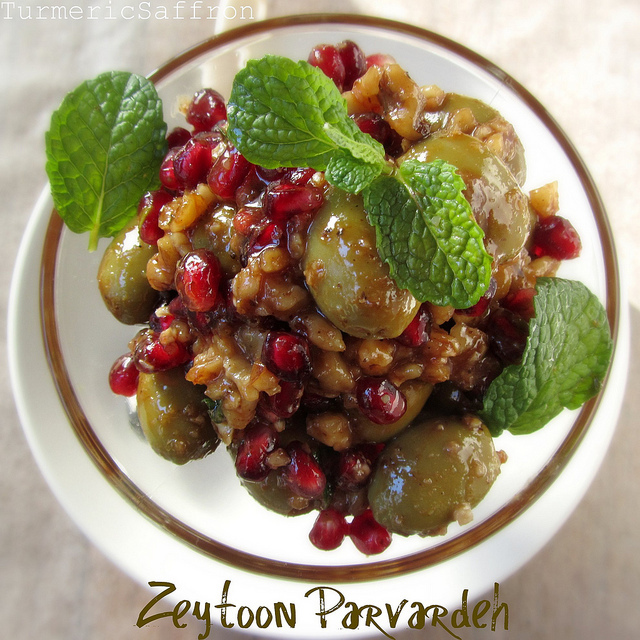 Serve warm with basmati rice, mast o khiar, salad shirazi, and torshi. Hey, we made this at our Persian dinner, too! :) Lovely stew. Your photo and presentation are gorgeous, btw. btw, what main dish i can make for persian new year, Azita ? I would like to make something for my husband, since he has no family here..
Maninas, It is a lovely dish and I'm glad you've made it before. Pleas let me know if you have any questions. Happy New Year to you and your dear family. btw i know this may sound sacrilegious, but my grandmother taught the cook to make the split peas separately and add them in the end so by mistake, he does not overcook them. that's how i make it, too. Warming stews like this are the best. I do hope you share more of them in the future. What gorgeous pictures! That bowl is so cute...love the shape. Sounds like a wonderful specialty I would love to try! Yummy with fried potatoes! Yum....this stew is my families favorite. Love your recipes I have tried a few of them and they are delicious, and the presentation and photography makes me want to cook. I hope you know I'm a big fan. A wonderful dish! So flavorful and healthy! Great flavors. 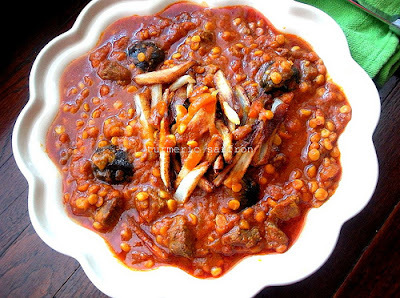 I love Persian stews like this one; I remember tasting it for the first time in L.A at some Persian friends and it was love at first bite! I drjeddmons on my own they were golden brown at the time and for the cook I cut them in half and reseeded the. As well to avoid a bitter taste.....it works so u can improvise with Ur own home made dried lemons. Anonymous, Yes, it's possible to make this dish without the dried lemons. You can use lemon juice instead. One of my favorites. Thank you for posting your version. Can't wait to try it. I was wondering about the dried lemons. Are they similar to preserved lemons? Are they sold in jars, or some other packaging? And lastly, what is the flavor like (lemony obviously! ), but I'm wondering if they add a noticeable sour note to the stew? I love sour flavors, so this is not a bad thing! Thanks. I came to this stew from a different direction, having eaten it in a Persian restaurant and then asked the lady in the Persian grocery store how to make it. So I ended up using ground lemon (sold by her) which is translated on the label as GROUND LEMON OMANI. Less than a teaspoon is enough, and much easier than boiling dried lemons. The stew is unbelievably good and I don't think it would be at all the same without this addition. Just now when I googled it by that time, I found it for sale online. Julie, Dried lemons/limes(limoo amani) are first boiled in salt water and then left to dry in the sun or dehydrated. They are sold in small packages in most Persian or Middle Eastern stores. 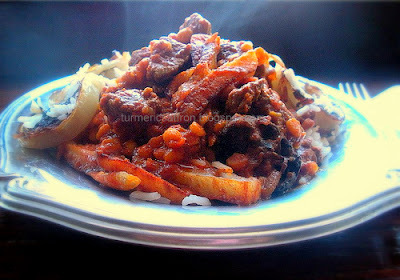 They add a wonderful sour flavor to lamb/beef stews. If you like sour flavors give it a try you might like it! Thank you for visiting! Thank you very much for this wonderful recipe! I have two quick questions, however. 1)How many does this recipe serve? and 2) If I use ground beef instead of stew meat, as my grandmother did back in Iran, should I use the same amount of beef(i.e. 2 lbs), more, or less? Anonymous, this recipe serves 4-6. If using ground beef I would use 1 1/2 pounds of beef. Thank you for visiting. Oh, I have just found your blog after searching for Khoresh recipes. My mouth is watering! My father is from Iran, but like you was educated in the west, in the UK. He married my English mum who did learn to cook Iranian food from my grandparents who would visit. Now I am grown and married and I live in Germany. I miss this food of my childhood. I will try and cook something from your blog regularly. I'm American married for 25+ years to an Iranian and have learned to make many Persian foods. I love Ghaymeh, more so than my husband. I prefer to add ground limon omani. I also like to use the PikNik shoestring potatoes as a topper (found in chip aisle)but nothing beats the homemade fried potatoes. Once in a while I also add a tablespoon or so of curry powder in addition to the turmeric. I've never tried adding rosewater to this but will and see how that goes over. Thank you for your site! It's great. The Shirini Kishmishi came out great. My Iranian sister-in-law loves them. I love khoresh ghaymeh too. Thank you for stopping by and your kind words. I'm born here in Los Angeles but dad is persian... I LOVE persian culture and food. Going to make this dish soon. Thanks, yourwebsite is really nice! I am curious what type of yellow split peas you use? Are they the typical yellow split pea or chana dal? They are the typical yellow split peas. I want to make this dish for guests coming this weekend. I have Powdered Limu Amani but have run out of the regular type and won't have any access before the event. Do you think I can replace it for a decent result? Brisa, limu amani could be used in a powdered form. You can use about 2 teaspoons of powdered lime instead. You can find dried limes at most Persian/Iranian grocery stores and you may use lime juice instead of dried limes. I made some minor changes in the original recipe and I hope you'll find them useful. Made this for my Mom's bday last night and it was a hit! I love this site! This is the only site I found close to my families recipes. I have no idea where to start and this makes me so excited to get cooking. My husband is a white boy who was so sure this recipe didn't call for cinnamon. He claims he has a very sensitive palate. Now that he lost this bet to me he has to massage my feet for a very very long time. You may use green split peas. You can check your local Indian grocery store for "Chana Dal", it is the same thing as yellow split peas. I just made this last night and it was delicious! Thank you for these recipes. They really bring a small piece of home to a foreign country! Excellent recipe! As in France's countryside persian ingredients are not common, I replaced the dried lemon with 2 pierced candied lemons sold by moroccan sellers on the market. It was really delicious served with saffron rice. I also added some dried raisins about 30 minutes before end of the cooking time. My first attempt at cooking Gheymah (sp ?) was tasteful to me. The peas I added later were too crunchy but I'll try again. The flavor was great! You may cook the peas separately and add them to the stew in the last hour of simmering. We want them fully cooked and soft but not mushy. Happy Nowruz Azita... It worked about better this time. I found dried Limons at a local Mediterranean market even here in the upper Midwest of Wisconsin. Makes a big difference. Interesting, I am from the East Bay of SF too and only now appreciating the food I had at my fingertips. Thanks again. Made this recipe today. It was great. I used less beef and more split peas, and fresh tomatoes processed in a blender, but kept all the same spices. It turned out really good. Thank you! I am British and was introduced to Iranian food recently when I visited an Iranian restaurant and loved the food as well as the enthusiasm of the head Chef. I stumbled across your site whilst searching for Iranian recipe. The Khoresh Gheymeh is absolutely delicious as well as you recipe for Mahi Shekampur which I cooked for Easter and the Family adored it. Please continue the good work and introduce us to the best of Iranian food. hi azita joon I found the missing element at last ! and that was the addition of rosewater ! now I can enjoy my mum's cooking as I used to 40 years ago ! thank you .